Turning the corner casually walking home from school you accidentally bump into a big guy with a short temper. This guy is angry with you, and you can see right then and there that he wants to fight you. In any potentially dangerous situation your body will automatically receive impulses from the brain, and release epinephrine. (Not to go into detail.) In other words you get that adrenaline pumping through your blood. What follows this physical phenomenon is an instant mode, your body reacts "fight or flight". Though it may seem there are more choices then just "fight or flight," flight can be broken up into different categories. When they refer to the term "flight" they are actually saying what you would do to avoid the fight. So it could be talking your self out of it, sending your friend to fight, or running away is what usually comes to mind with most traceurs. In today's society it almost seems like running away from a fight would make you "less of a man" or "a wuss" depending on the seriousness of the situation. It is often the seriousness of a situation that determines what actions we take. Either way all of us (or most of us) practice parkour which takes on the ability to efficiently escape someone chasing you, or rescue someone in need like a fire fighter may. The actions we take in any given situation may be heavily based upon your training or practicing. Traceurs are training in ways that would make great escape. So it is very likely placing a traceur in the situation above they will take the flight response, because in the back of their head this is what they train for. Taking the "fight" position you could easily refer to someone who practices martial arts. The reason they practice martial arts may be varying, but the route of all martial arts is to create a means of self defense when a fight is necessary or that is the path which is chosen. It makes perfect sense doesn't it? 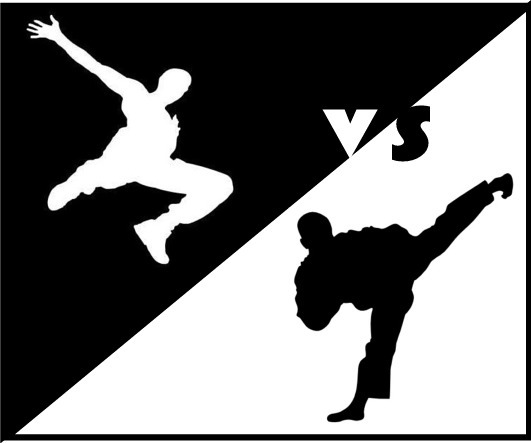 "Fight" is to martial arts that "flight" is to parkour. Many traceurs also practice martial arts which will in turn effect the decision they may take in the situation above. There would be no reason to fight the guy unless it comes down to; should you run away and dismiss any physical confrontation, or fight the guy so you don't take on the name society has put on us for "wussing out"? Though I don't think our decision should rely on how others will see us, but more importantly it should rely on what you would predict the final outcome would be. In many cases your decision may have to be quick and rely on instinct, and every situation is different. There may easily be a situation where you are cornered and must fight your self out, or you might fight if you must defend some one else, you wouldn't want to take running off while your friend is getting beat up. Or sometimes flight may be the only option. A situation might not always consist of confrontation with another person; it could simply be you are escaping a burning building. So many situations to prepare for, so what do you do? Do you try and visualize every possible situation that might come up? That would be near impossible because the varying situations are limitless. So now what? Just go out and hope for the best? I think not. There's something I call "training instinctively". While in your normal training sessions (whether it may be parkour or martial arts) you can learn to train instinctively. The number one thing while training is to be aware of your surroundings, anything that may be around you; the birds flying, or cars driving by, but still keeping focus on your body's movement and thoughts. In any given situation it is always important to know what is going on around you. What is ahead of you? What may be behind you? What can you use for potential tools to help your situation? Beginning your training session, something important you can do to have the "training instinctively" mind setting is to go into your training session prepared. "I got my two .44 magnum hand guns, a bullet proof vest, and a pack a gum, so I'm all ready for any situation." No not that kind of prepared, you don't want to be carrying all of that around with you where ever you go. Also traceurs train with only the bare necessities (a pair of shoes and hopefully clothes on their back). You can have all the equipment in the world but without the mental state it will do you no good. The mental state I find is one of the most important places to start when taking on a discipline such as parkour. It's your mind that controls your body, actions and your instinctive nature. Go into your training session with awareness of everything and everyone one that is in that area. Constantly keep an eye on things around you through your peripheral vision, but still focused on what you are there to accomplish. Practice running through your training grounds with out having to stop and think what you want to do. These techniques don't even have to be done while training. They can be done any where you may be. At the grocery store look for any exits in your head if a situation were to arise. Think of routes you might take, what obstacles would get in the way and what obstacles may work to your advantage. And if any of you have an imagination like me it shouldn't be hard to day dream doing a sweet parkour run while you are at work. Obviously the situation you are imagining isn't likely to happen, but by keeping your mind constantly moving you will have improved instincts on what to do in any situation. Some of this may be tricky to do at first but you can never improve until you are willing to practice it. All of this will prove useful in any situation because in any situation whether you decide to take on the "fight or flight" position, it's the way your mind reacts to the situation that will bring the final outcome. This is just the beginning, I could write a whole separate article just on "training instinctively" (which I may do). The most important thing though is that you can be prepared within your body's movements on how well they perform, and your instinctive thoughts which will lead to the actions you take. If one is to prepare them self for any situation I don't think it should be just for the "flight" tactic because that tactic might not always be available (referring to those of the parkour community). So if one reason you are training parkour (besides it being fun) because you want to be prepared for any given situation, I would highly recommend some form of martial arts or self defense be included with your normal parkour training, or the other way around. If you don't have the opportunity to take classes, just remember "training instinctively" and you will be surprised with the way your training sessions will change and the way you will view your environment. I take this supplement with coffee and stay alert for all day till evening and still be able to go to sleep at a decent time. Would recommend to others. Hi I really appreciate your all efforts which is specially for the Fight for Flight well done.